Room Correction software is a two-step measurement and calibration process that improves the frequency response and performance of studio monitoring. I've used Sonarworks Reference 3 room calibration software for a few years, previously using IK Multimedia’s room correction system ARC 2. In this article, I compare the two room correction systems based on my experiences with both in the studio. Both Sonarworks & IK Multimedia supply their own types of measurement microphones, both are similar in design. ARC 2 software is available as a bundle that includes a measurement microphone, a small mic clip and hard case. We have yet to try the updated ARC 2.5 software update with new MEMS microphone but we will get a system in over the next few months for review. From what we understand ARC 2.5 isn't a major rework of the software, instead, the application performs a better job of measuring the room as the MEMS microphone is far superior to the previous ARC measurement microphone. Purchase the Sonarworks measurement microphone for €69, giving you the ability to measure your room with a 21-day free trial version of Reference 3. Purchase the Reference 3 software bundled with the microphone. A microphone calibration profile needs to be loaded when starting the measurement process in Reference 3. Sonarworks supply microphone calibration files unique to each microphone available on their website. These files enables the software and microphone to work together in perfect harmony. ARC 2 does not require a unique microphone serial number or microphone calibration file, however, the software does ask you to confirm the type of ARC microphones you have as ARC 1 users can crossgrade to ARC 2 software without having to repurchase a microphone. Reference 3 requires the Sonarworks microphone to be horizontal, facing towards the stereo centre of the monitoring. ARC 2 requires the IK Multimedia mic to be pointing at the ceiling vertically. Two very different approaches, clearly both systems have two very different methods for crunching the numbers. Both products are quick to setup, taking less than 15 minutes to complete. Both have a stand alone measurement application that runs in the operating system and both systems feature a separate plug-in component that needs to instantiated on the final insert point on a DAW master. The plug-in components for both systems are where the measurement/correction files are loaded and it's these plug-ins users monitor through when mixing to achieve the room correction process. In terms of the measurement process, I find Sonarworks Reference 3 to be the better of the two systems as the software walks you through exactly what needs to be done in terms of microphone placement. Reference 3 displays in real-time the position of the microphone in the room and is very clever as it will not take a measurement until the microphone is in an optimal position. The measurement process in ARC 2 sadly isn't as intuitive. A link to a .pdf manual shows us where to roughly position the microphone. This process feels like I'm guessing where to position the microphone and each measurement needs to be trigger by the user, not the system. I am sure we don’t need to be millimetre perfect with this kind of thing but the ARC measurement process does leave me thinking if I measured the room correctly. Both systems require an optimum audio level for the measurement process. I ran the measurement process for both systems back to back and found that Reference 3 needed more volume to the microphone/software than ARC 2. I am not sure if that is at all relevant but it is another difference between the two systems. The final measurement stage in Reference 3 is where we save the calibration file. The file displays the frequency dips and peaks in the room very clearly in an EQ plug-in fashion. ARC 2 isn't as in-depth with the reading, we only get the option to save the calibration profile and select a speaker symbol to represent the monitors. Both the plug-in components must be inserted as the last plug-in on a master track. 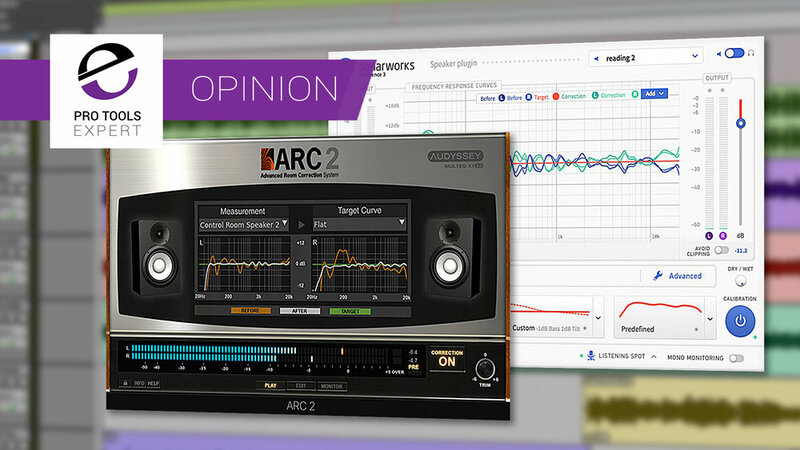 In Pro Tools, Reference 3 is categorized as an EQ where as ARC 2 is located under OTHER. Both plug-ins add about 500 samples of delay into the chain, however, Reference 3 can increase up to 3559 samples when the clever filter phase is set to linear; this is where the two room correction systems start to differ quite dramatically. ARC 2 features a software monitor control interface, the ability to adjust the curve to suit your taste and a virtual monitoring system. Reference 3 offers the same features but ARC 2 doesn’t offer any further properties to adjust. The ARC 2 room correction setup stops at the point I insert the plug-in component with the measurement calibration file - insert ARC into the DAW and forget about it… start mixing. There isn't much to tweak in ARC. Reference 3, on the other hand, features some additional properties to tweak the performance of the room correction such as the phase relationship within the stereo image and some calibration limits. There is even a mix control for dialling back the correction, similar to parallel processing. I have blind tested both the calibrations in my studio with some tracks I know very well. When switching between the two I noticed Reference 3 had a well defined low end and strong clarity in the upper midrange. ARC 2 also brought focus and clarity to the upper mids but didn’t quite refine the lows as well as Reference 3. Of course, these observations are mine, in my room, with my music with my monitors. These findings are unique to me. Digital creatives use a variety of apps such as Final Cut for video editing or iTunes for music streaming. Sonarworks developed Reference 3 with a feature called System Wide enabling users to monitor all computer audio through the room correction process meaning the room correction is no longer exclusive to a DAW workflow. What's makes System Wide special is that the Reference 3 plug-in component does not need to be loaded on the last insert on a DAW master track saving users the hassle of bypassing the plug-in when bouncing mixes. ARC 2 and ARC 2.5 doesn't offer a feature like System Wide but there is a workaround on Mac using an application called Audio Hijack. Audio Hijack is well worth having in your app collection. Under the Audio Hijack Application Playback module add in a plug-in module (ARC 2) and then route that plug-in to the outputs of the Mac. I personally feel Sonarworks Reference 3 is the better of the two room correction systems for a couple of reasons. The seamless integration of System Wide enabling me to be able to monitor all my audio on my computer through room correction. The easy step-by-step setup of the software. The experience of the setup really gave me confidence in the software’s ability as the measurement process was very intuitive and also displayed the correct measurements between my monitors and listening position. Both systems do a great job of room correction but I feel the Sonarworks system is better as it offers a broader selection of properties that I use to get the correction to my taste and flawless room correction integration with my entire computer system.